My first experience of theyyam was in a private house on the Malabar coast in southern India, where a god was required to bless and purify the family and guests after a wedding. Everyone was very friendly towards me and the bridegroom took me upstairs to meet his new bride, and introduced me to all the family. They gave me snacks and juice, filling up my glass whenever I took a sip, but I was more interested in going to see the performers and I slipped outside again as soon as I politely could. The performers had set up a small red tent at the edge of the house and this, Sandosh Maden told me, was their shrine. 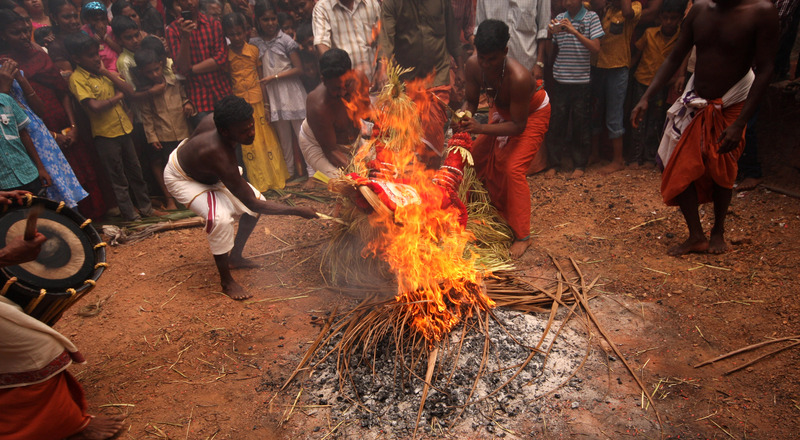 Sandosh was only assisting the god today, but he had trained in theyyam since he was a child. He had a gentle, expressive face and, like his fellows, was bare chested and barefoot, with a clean white lungi tied around his waist and a chain around his neck. 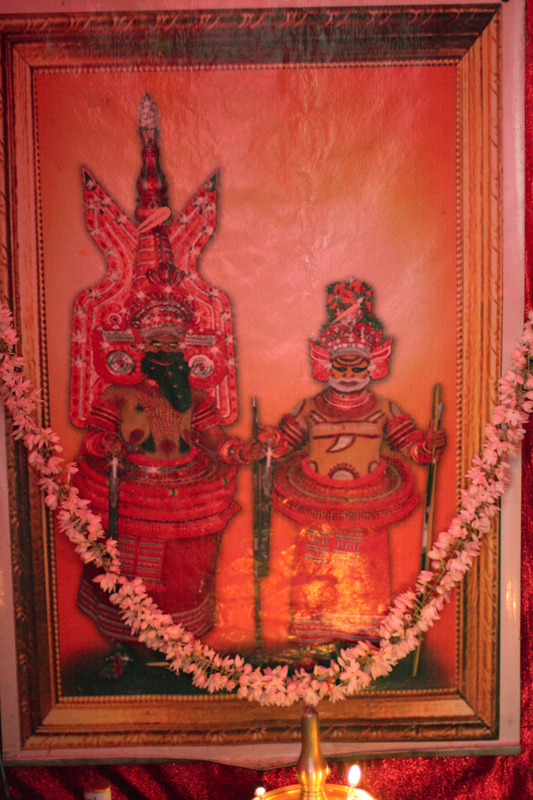 Inside the tent was a painting of two gods, garlanded with jasmine, with a small oil lamp burning in front of it. Maha Vishnu was pictured on one side, with a long dark beard, a sword and an enormous headdress, while to his left stood Muthappan, holding a sword in one hand and a bow and arrow in the other. His headdress was much smaller but still elaborate, garlanded with jewels and topped with flowers. ‘You will see this one,’ Sandosh said, pointing at Muthappan, and indeed within the next two hours I was fortunate enough to sit close by and watch this god almost imperceptibly become manifest in a man. I knew very little about theyyam at this stage, having only arrived in northern Kerala that morning, on the train from Karnataka, but the few lines describing it in the Lonely Planet had intrigued me. So I’d stopped in Kannur and was staying at Costa Malabari, a comfortable, breezy guest house near the sea. The accommodation was run by a friendly man called Kurian who had lived in the area for many years and was now an expert on theyyam, and it was he who had arranged for me to visit this house. It wasn’t far from Costa Malabari and Kurien gave me a lift on the back of his moped and said he’d pick me up later. 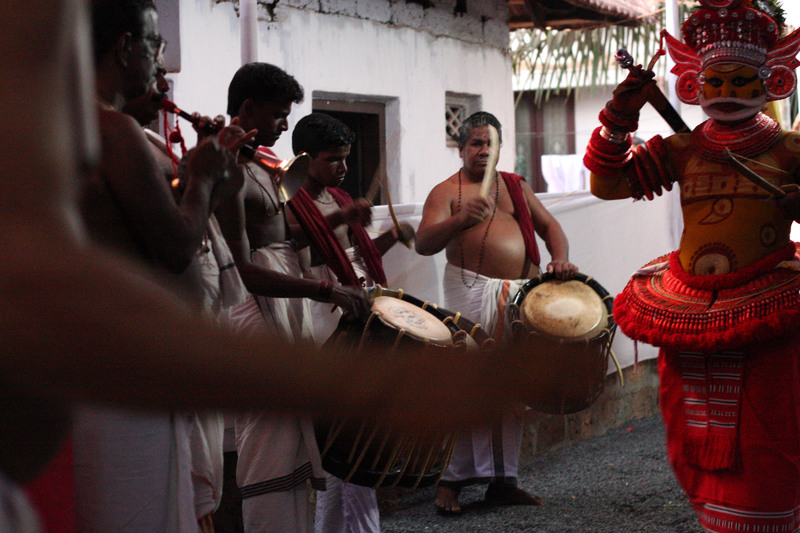 He’d warned me that, although theyyam is a highly evolved art form, it isn’t entertainment. It’s an ancient ritual whereby a man actually becomes a deity, giving the devotees a chance to directly communicate with their god as a living being. I sat on a plastic chair and watched as Shaijo Papanshe smeared a yellow paste made from turmeric onto his face. 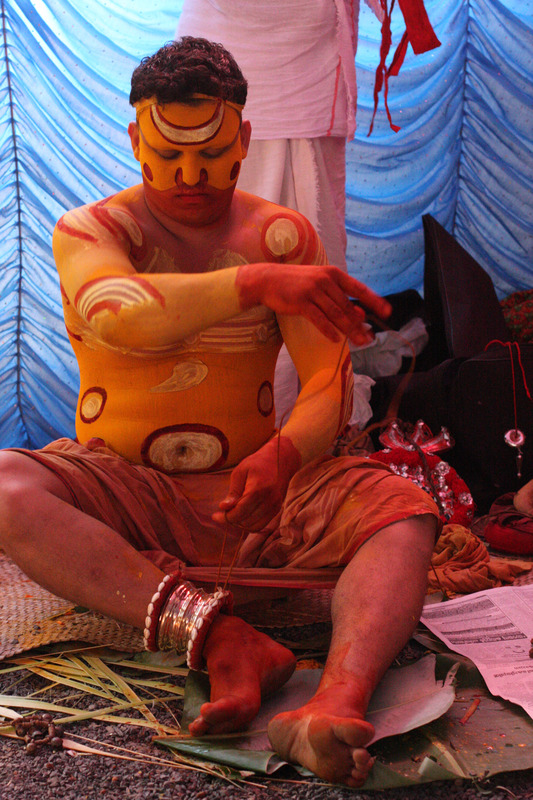 Sandosh and another man painted Shaijo’s body with the same yellow turmeric, then used a white rice paste to draw lines and symbols on his arms and torso. These were outlined and heightened with red. Muthappan’s make-up is relatively simple, compared with some of the deities, and Shaijo applied most of it himself. Nevertheless, his appearance was gradually transformed. The application of make-up is called ‘face-writing’, or ‘body-writing’, and an artist must know exactly how to draw all the different designs required for all the deities his particular community is allowed to perform. He must also know how to make all the costumes and headdresses, must know the stories and songs and be able to sing them, and to play the drums. Above all, he must have intimate knowledge of the character of each of the deities. There is no school to teach theyyam and a young boy learns by watching his father and uncles, who gradually pass on the skills. It is highly physically demanding and the boy must master the ability to stay awake for long periods, often without food or water. Theyyam dancers have a low life expectancy and many use toddy – fermented palm wine – to give them the strength to keep going all night. Shaijo outlined his eyes in black (from the soot of oil lamps) and put on heavy woven bracelets, silver anklets decorated with cowrie shells, intricate waist bands and neck bands and, finally, a splendid mudi, or headdress, crowned with hundreds of flowers. When it was finished he looked startlingly like the figure in the picture, which in turn conformed to an image dreamt or envisioned centuries ago by a highly respected guru. Further to this, he was also in the process of an inner transformation. ‘Muthappan’ literally translates as ‘father’s elder brother’. He is an ancestral god, a hunter, and a fusion of both Lord Shiva and Lord Vishnu (two of the main Hindu trinity of Brahma, Vishnu and Shiva), yet older than both of them. A usual theyyam ‘performance’ in a shrine will be preceded by several complex preliminary rituals, but these were much reduced for this appearance at a house. Instead, Shaijo gave offerings to the image in the shrine and then maintained a serious, meditative aspect as he got ready, hardly speaking. The actual moment when the man becomes a deity happens when he looks at himself in a small hand-held mirror. This is called mukhadarshanam, ‘the seeing of the face,’ and is an intensely intimate, personal occurrence. I watched as Shaijo Papanshe lost himself, no longer focussing on his own reflection but on the enigmatic features of a god. From this moment on he was treated by everyone around him with all the caution and reverence due to a divine being and I genuinely felt a powerful new energy pervade the air. By this time, two skinny boys had started beating hell out of large goat-hide chenda drums, hung from thick cords around their necks, while an older man with a large belly whacked at a base thaala chenda drum with a tamarind-wood stick and another man played a kuzhal, a type of pipe instrument. The guests had come out of the house and were standing in a crowd near the door, watching as Muthappan began to dance and strut up and down beside the drummers. He was holding a bow and arrow and, later, Sandosh reverentially handed him a sword. Muthappan’s favourite offering is toddy and he had several large gulps of this from a sacred silver cup. At one point he gave anyone who wished a handful of uncooked rice and we all threw this over him at the culmination of one of the rituals. He danced up and down with the sword, swinging his arms and hopping back and forth, then gave blessings to a small group of men, including the bridegroom, while holding one hand raised in the air, clutching some small strips of plantain leaves. At the end of this he threw the leaves into the air. His movements were jerky and unpredictable and the women held back from approaching him until he had sat down and was ready to receive them. Then everyone, including the children, formed a queue, and Muthappan spoke to them each individually. I was urged to go up to him too and was worried that the god might take exception to a foreigner – he had an aura of contained power and authority which was intimidating. I was quite ready to believe in his supernatural qualities. Thankfully, he spoke to me seriously but gently and, although I didn’t understand what he told me, I felt honoured to have been so close to him. The word theyyam is thought to be a corruption of daivam, which means ‘god’ in Malayalam language, the language spoken in Kerala, but has also come to mean the style in which these gods are worshipped. It is an ancient practice, only found in the Malabar region of northern Kerala, and it is believed to have started with tribal people from mountainous Wayanad, who came to the area around Kannur to work in the fields. Then again, people are unwilling to categorise or historicise theyyam and much about it is shrouded in mystery and myth. There could be as many as 450 deities, of which about half are still actively worshipped, but sometimes a deity goes under different names in different localities. They have powerful, ambiguous and unpredictable personalities and it is fairly certain that their origins pre-date Hinduism. The traditional offering is toddy and fish, rather than flowers and fruits, whereas Hindus are forbidden in temples after eating fish or drinking. Over the centuries, however, Hinduism has strongly influenced this indigenous religion and now many of the gods and goddesses have become associated with Lord Siva and his consort, Parvathi. More unusually, several theyyams are Muslim deities, due to the existence of a large Muslim population in Malabar since the earliest times, when trading links were established with Arabia.